Breathtaking Scala prom dress 48950 is sure to turn heads at your next social event. This dress highlights a straight across neckline with removable straps that can make it strapless. 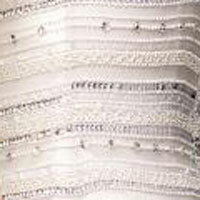 The sleek silhouette is embellished with hand sewn beads work that create a stunning pattern throughout the dress. The back of this dress features a center back zipper closure.